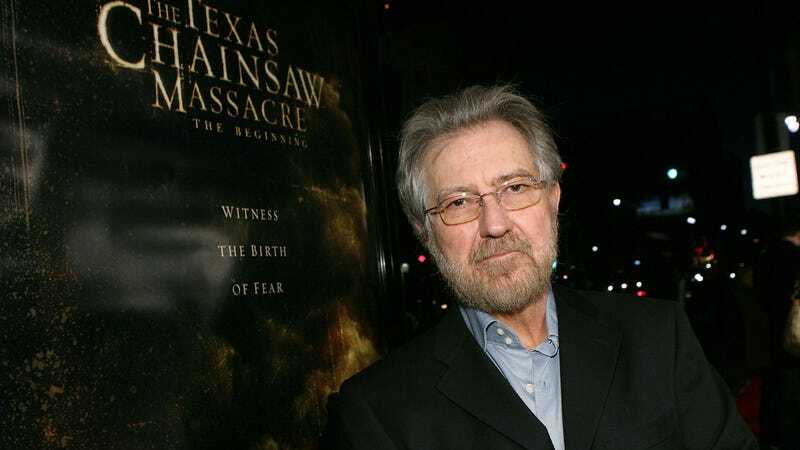 Tobe Hooper, a director who radically reshaped the landscape of American horror in 1974, when he took a shoestring budget, a cast of unknowns, and an unflinchingly brutal cinematic sensibility, and transformed them into The Texas Chainsaw Massacre, has died. According to Variety, Hooper was 74. Originally employed as a documentary cameraman, Hooper became a household name (around a particularly ghoulish kind of house, in any case) when he took some ideas about isolation, loneliness, and the violence cropping up in mainstream news, some notes taken from the life of cannibalistic serial killer Ed Gein, and an instantly iconic power tool, and combined them into one of the most successful low-budget movies of all time. Responding to the claustrophobia and absolutely pitiless regard with which Hooper treated his characters (and his actors, if anecdotes from the set are to be believed), moral watchdogs condemned the film, while the more squeamish breed of critics panned it. That didn’t stop audiences from flocking to Massacre and its patently false “based on a true story” conceit, allowing Leatherface, Grandpa, and the rest of their murderous clan into their nightmares for years to come. Largely inspired by Hooper’s unexpected success—Massacre made $30 million off a $300,000 budget—the American horror genre transformed itself from rip-offs of Italian giallo movies and exploitation films into the domain of hulking, inhuman killers out for blood. Hooper dabbled for a few years in the genre he’d helped codify, but his rising star soon began drawing attention from other quarters; in 1979, a screening of Massacre convinced producers to hand him the TV mini-series of Stephen King’s vampire novel Salem’s Lot. As the years progressed, Hooper’s film career remained largely in the world of low-budget horror, occasionally tossing out a Spontaneous Combustion or an adaptation of King’s “evil laundry-folding machine” story The Mangler. (He’s also credited as a producer on the regular-as-clockwork attempts to revive Massacre as a new horror franchise.) Hooper fared somewhat better on TV, where name-recognition could score him a periodic gig guest-directing episodes of various horror anthologies. Most notably, when Showtime assembled its Masters Of Horror anthology in 2005, tapping high-profile horror directors to adapt various scripts and short stories, Hooper was prominent on the list, right alongside John Carpenter, John Landis, Dario Argento, and Takashi Miike. In the end, Hooper’s legacy will be inextricably intertwined with The Texas Chainsaw Massacre, a movie he frequently categorized as “more than a horror film.” “I wanted to be outrageous and break the rules and also involve you and make those characters real for you,” he told Interview a few years ago, emphasizing the tricks—hiding Leatherface’s appearance from his cast until the monster’s first appearance, employing numerous quick cuts, using a microscopic lens to capture the veins bulging in actress Marilyn Burns’ eyes—that he employed to so effectively alienate and horrify his audience, while simultaneously sucking them in to the film’s dirty, bloody world. Hooper’s death was reported on Saturday night.